You can easily mistake one for the other if you aren’t paying close enough attention. While the two pests have a lot in common, there are some key differences amongst them, such as the fact that termites will eat your home right out from under you while ants will not. That major difference between them is a good reason to make sure that you know one from the other with certainty. So why do some have wings while the others don’t? In the case of both ants and termites, they live in large colonies in which a sort of cast system of classes are established. The winged ones are the class that has been groomed to mature sexually and thus act as the candidates of the colony that will be solely responsible for reproduction. The other non-flying variety is the workers who serve the reproductive cast. Swarms of winged ants and termites can occur during a part of the season which is conducive for mating, such as warm weather. 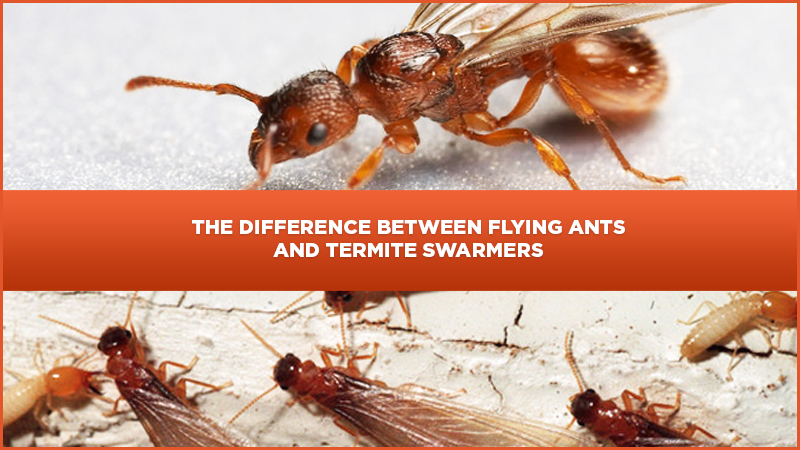 There’s a notable difference between flying ants and termite swarmers upon close inspection. A common misconception about winged ants and termites is that the only one with wings is the queen. This is true of some species of ants but is not true of termites or other species of ants. Ants and termites both have the queens of their colony, but if the ant colony’s queen is killed, the entire colony will have a strange funeral ceremony in which they gather salt around the queen and then wait there until they all die as well. Why ants gather salt is unknown. Termites on the other hand are not killed so easily. If their queen dies, they will simply produce another and go on eating your house. It is also commonly thought that ants and termites are related. This is an understandable estimation, but scientists have actually linked termites as being genetically related to cockroaches; the most successful species of pests the planet has ever known. To tell the difference between winged ants and winged termites on site, there are visual cues that will give it away. For instance, termite’s antennae are straight, while ant’s antennae are jointed, similar to the shape of an elbow joint towards the centre of the antennae. Another visual clue is the shape of the body. An ant’s body is more clearly sectioned than a termite. Ant’s middle section becomes narrow between segments, whereas termites have a straighter line of physique. A termite’s body segments are more of a line than an hourglass. Knowing which is in your presence will tell you the severity of the situation, but in both cases of seeing ants or termites with wings hanging around your neighbourhood, the wise thing to do is act swiftly and call an expert to take care of the problem before it becomes a full on insect hostile takeover! With ants, you can take a bit more of your time, but with termites, you’ll want to act as quickly as possible to avoid a problem that could cost a ridiculous sum of money or even your entire home!